The library is unexpectedly closed today due to a maintenance issue. We apologize for the inconvenience and would also like to remind you that we will be closed Saturday and Monday for the President’s Day Holiday. The library will reopen on Tuesday, February 19th at 10am. 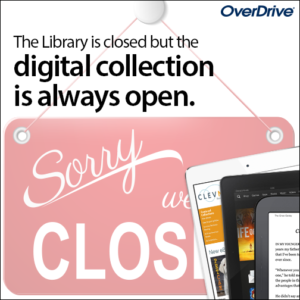 In the meantime, we encourage you to take advantage of Overdrive and Hoopla as they are always available.